After spending a good amount of August either on the road or splurging on fun meals with friends and family, I’ve been eating more conscientiously for the last week or so, as I get my eating back on track. Of course, eating with a focus on healthy foods doesn’t mean boring. Nope, it isn’t all carrot sticks and water here. Rather it’s finding creative ways to impart flavor while keeping calories and fat in check. This recipe is a perfect example. On a recent Sunday, we were home for the afternoon that would be filled with horse races and snacks. When I make snacks there are a few things I try to incorporate. First, I like to have at least three different snacks if it’s the two of us. Second, I like to make the snacks smaller, so you can go back for more, rather than having one big serving up front. Third, I try to keep at least a portion of the snacks healthy. 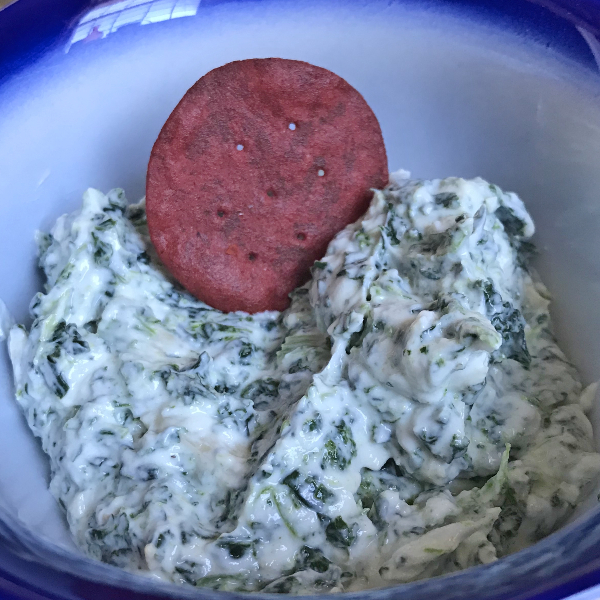 When I was making my menu for Sunday, I knew that I wanted to find a new dip recipe that had Greek yogurt as the base. I also wanted to make it a cold dip. Even though it was September, we still were experiencing hot, summer-like temperatures. Greek yogurt provided a nice, creamy base for the dip; now I just needed to determine how to add texture and flavor. Spinach was a natural go-to. 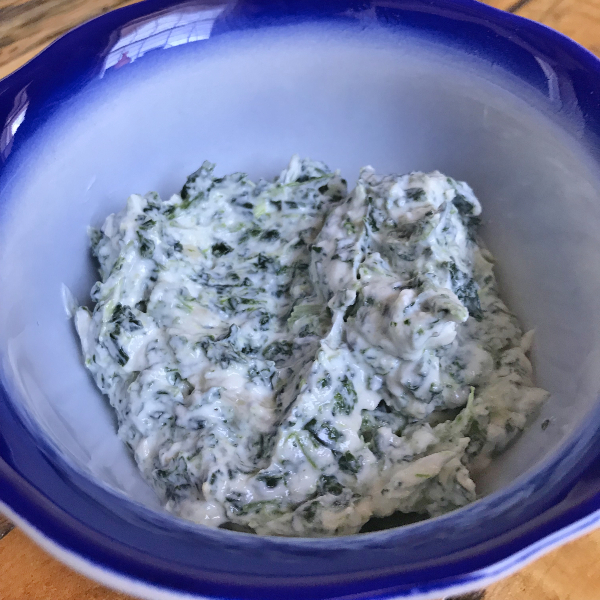 I always have frozen spinach on hand, and it adds a little bit of flavor and makes the dip even healthier. The trickier part was figuring out how to add flavor. Garlic powder was an option, but it’s kind of flat. Raw, minced garlic was another choice, but its flavor can be too intense. So, why not used roasted garlic? Roasting garlic is so simple and can be done in the toaster oven. Plus, it provides a smooth, rich garlic essence. 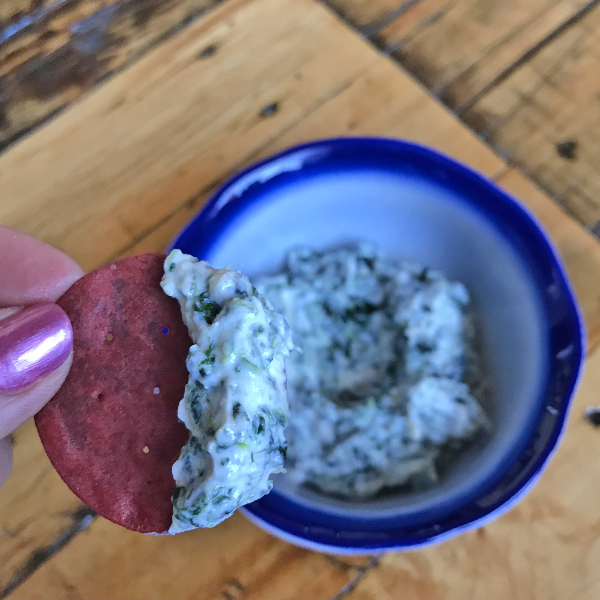 Served with carrots, celery, pita wedges, or healthy crackers (such as the beet thins in the picture), this is a dip that will keep your healthy eating on track! Place garlic on small piece of aluminum foil. Drizzle garlic with olive oil, and wrap securely with foil. Squeeze individual cloves to remove garlic from skins. Combine yogurt, spinach, and roasted garlic, stirring well. Chill for at least an hour before serving.